Holiday.gr - Kastro, a trip to a myth! Kastro is one of the villages that every visitor should see and walk in its graphic paths. The region where this small Kastropolitia is, is inhabited since archaic times. The medieval settlement is built on an abrupt hill in the same location with the remains of the ancient Acropolis. Excavations brought into light findings from Geometrical period. 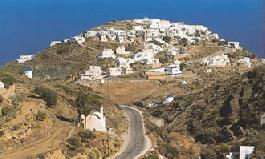 Kastro was the capital of Sifnos during archaic times, medieval and newer period until 1836. The current feature of Kastro is a characteristic specimen of the architecture of fortresses. Houses are with two or three storeys, consecutive, so that their outside walls were the walls of the fortress. In those houses lived folk class, while in those inside the settlement and more protected from invasions, lived aristocrats. Even today the entrance and exit is from old entrances-arches, the famous “lotzies”. Cars are forbidden inside the settlement. Visitors enjoy their walk in the medieval settlement and admire the homoeomorphous structure of residences, the old churches and the small graphic squares. Following the narrow cobblestone pavements and the stairs of the settlement, you reach the top of the hill where are the remains of ancient Acropolis. The view from up there is spectacle. While staying in Kastro visit the archaeological museum and see a rare collection of sculptures and pottery from Geometrical and Byzantine period. If you care for a swim visit the beach of Seralia. It is north of the hill near Kastro. You can approach it by going down many stairs. It is a small, isolated beach with pebbles. Been to Kastro ? Share your experiences!